and be ye holy: for I am the LORD your God. Sanctification is a theme common throughout Scripture. All people of all times are called to be sanctified and to sanctify themselves. We know this is because human flesh is weak and sinful, blemished and not fit for the perfect holiness of God. Through the ages, God has made various requirements and commands in regard to sanctification, the most pertinent of which are described for our edification in the New Testament, and we will be looking at those shortly. Before we consider the applications of sanctification in the New Testament, it is helpful to understand what sanctification is defined as spiritually and Scripturally. The term "sanctify" comes from the Hebrew word qadesh (Kaw-Dash') meaning 'to set apart to sacred purposes, to hallow, purify, consecrate, to make perfect, to make holy.' When we read in the Scriptures that we are sanctified by God through the gift of grace presented to us in the redemptive work of the Lord Jesus, we don't often stop to think about sanctification in all the ways the Bible presents it to us. In the Gospel of John, we read twice in the Lord's own words that He too has been sanctified. This particular use of the word "sanctify" is in the sense of a 'setting apart' through consecration. In John 10:35 the Lord Jesus spoke of Himself as the One "whom the Father hath sanctified, and sent into the world" (John 10:36). He was set apart to accomplish His Father's will, as He says in John 6:38 For I came down from heaven, not to do Mine own will, but the will of Him that sent Me. And again in Luke 2:49 And He said unto them, How is it that ye sought Me? wist ye not that I must be about My Father's business? And finally in Hebrews 10:9 Then said He, Lo, I come to do Thy will, O God. In John we also read the Lord's prayer for His disciples in which He says, "for their sakes I sanctify Myself, that they also might be sanctified through the truth" (John 17:19). The Lord Jesus became man, and in so doing, set Himself apart from heaven and the rights that belong to Him, and became humbled and humiliated for our sakes, that we might be sanctified by the truth. Christ prayed to the Father regarding this very matter in John 17:17 Sanctify them through Thy truth: Thy word is truth. Therefore we see that our Lord was sanctified by the Father, to accomplish His will, and He sanctified Himself for us in order to make the truth known to us. When we are redeemed by the blood of the Lord Jesus and justified by faith from sin, we are also sanctified completely in Christ. This brings us to one of my favourite passages in Colossians: Colossians 2:6-10 As ye have therefore received Christ Jesus the Lord, so walk ye in Him: Rooted and built up in Him, and stablished in the faith, as ye have been taught, abounding therein with thanksgiving. Beware lest any man spoil you through philosophy and vain deceit, after the tradition of men, after the rudiments of the world, and not after Christ. For in Him dwelleth all the fulness of the Godhead bodily. And ye are complete in Him, which is the head of all principality and power. Through the Lord Jesus, we have completion spiritually; We are set apart for Him! He has "saved us, and called us with an holy calling, not according to our works, but according to His own purpose and grace, which was given us in Christ Jesus before the world began" (2 Timothy 1:9). His calling is "holy", and thus it is indicative of purity and blamelessness. Our Heavenly Father sets us apart from our past Godless lifestyle, the sins of fallen man, and even our own selfish nature, and makes us holy by covering us and our sinful human nature with the blood of His Son, our Lord Jesus Christ. We can recall 1 John 1:7 The blood of Jesus Christ His Son cleanseth us from all sin. This assures us that the Lord Jesus' blood cleanses us fully, and from the moment of salvation we are spiritually pure, blameless and wholly sanctified to God. To reinforce this, we must let scripture speak for itself: Hebrews 10:10-14 By the which will we are sanctified through the offering of the body of Jesus Christ once for all. And every priest standeth daily ministering and offering oftentimes the same sacrifices, which can never take away sins: But this man, after he had offered one sacrifice for sins for ever, sat down on the right hand of God; From henceforth expecting till his enemies be made his footstool. For by one offering he hath perfected for ever them that are sanctified. At the time when we make a personal, Spirit-led decision to be washed in the blood of the Lamb and sanctified to God, we are filled with the Holy Spirit of God, and we become saints. We can see how, in Jude 1:1, 1 Corinthians 1:2 and Romans 1:7 the believers being addressed were sanctified, set apart and, as it says in Jude 1:1, preserved to God. The saints are the 'sanctified ones' before God, called to be set apart from the life of our weak flesh; set apart to God for priestly service1, and inheritors of heavenly blessings in Christ Jesus. As the Lord Jesus said to Saul, later called Paul, in Acts 26:18 that his work for the Lord would be, "To open their eyes, and to turn them from darkness to light, and from the power of Satan unto God, that they may receive forgiveness of sins, and inheritance among them which are sanctified by faith." We see how soberly Paul took in this commission from the Lord Jesus, as we read in Acts 20:32, in Paul's own words when he stated, "And now, brethren, I commend you to God, and to the word of His grace, which is able to build you up, and to give you an inheritance among all them which are sanctified." As saints, The Lord also calls us His brethren; Hebrews 2:11 For both He that sanctifieth and they who are sanctified are all of one: for which cause He is not ashamed to call them brethren, Saying, I will declare thy name unto My brethren, in the midst of the church will I sing praise unto Thee. Therefore we again see the work is complete. He has redeemed, justified, sanctified, and bestowed His inheritance on those who intimately identify themselves with Christ. There is no further work to be done - when God looks on the soul of a believer, He sees no sin, only the blood of His Son. Again let us allow scripture to explain its own truth: 1 Corinthians 1:30-31 But of Him are ye in Christ Jesus, who of God is made unto us wisdom, and righteousness, and sanctification, and redemption: That, according as it is written, He that glorieth, let him glory in the Lord. And as well: 1 Corinthians 6:11 But ye are washed, but ye are sanctified, but ye are justified in the name of the Lord Jesus, and by the Spirit of our God. Hebrews 13:12-14 Wherefore Jesus also, that He might sanctify the people with His own blood, suffered without the gate. Let us go forth therefore unto Him without the camp, bearing His reproach. For here have we no continuing city, but we seek one to come. In Old Testament times, sacrifices were made to atone for the sins of the people. Certain animals were killed and their blood was brought in to the Holy Place by the High Priest as a sacrifice of atonement for sin. The bodies of those animals were taken outside the camp - away from the tabernacle - and there they were burned. The Lord Jesus was likewise sacrificed "without the gate", meaning He was killed outside of Jerusalem and outside of Judaism as it was then known. He requires us to also go outside of the worldly systems of religion and out of corrupted Christendom, and out of the world, so full of the lusts of the flesh, to be set apart for Him. the most trying persecutions will likely come from the self-righteous religious people and "christian" people who are offended by our stand for what is pure, righteous and Holy to the Lord. murder to the hearts of Bible believers. This is persecution worse than that of Islam. worthy to be attacked for Christ? While the work of redemption, the work of salvation, the work of justification and the work of sanctification are completed in a spiritual sense, we are still trapped in human bodies with sinful natures and tempted by fleshly impulses. The New Testament books, and especially the Epistles are literally filled with warnings for Christians to take heed to stand against the wiles of the devil and against that which defiles our bodies, and against the flesh, which is so corrupted and sinful. Let's take a few minutes to simply review some such warnings, as the Word of God is our ultimate guide and the Holy Spirit is our Teacher. Romans 6:20-22 For when ye were the servants of sin, ye were free from righteousness. What fruit had ye then in those things whereof ye are now ashamed? for the end of those things is death. But now being made free from sin, and become servants to God, ye have your fruit unto holiness, and the end everlasting life. 1 Thessalonians 4:3-8 For this is the will of God, even your sanctification, that ye should abstain from fornication: That every one of you should know how to possess his vessel in sanctification and honour; Not in the lust of concupiscence, even as the Gentiles which know not God: That no man go beyond and defraud his brother in any matter: because that the Lord is the avenger of all such, as we also have forewarned you and testified. For God hath not called us unto uncleanness, but unto holiness. He therefore that despiseth, despiseth not man, but God, who hath also given unto us His Holy Spirit. We have been called to "holiness" and are required to perfect holiness - this is sanctification, a quest for purity, which is a constant battle while we remain in these naturally sinful bodies. Paul talks about this constant battle in his letter to the Romans: For that which I do I allow not: for what I would, that do I not; but what I hate, that do I. If then I do that which I would not, I consent unto the law that it is good. Now then it is no more I that do it, but sin that dwelleth in me. For I know that in me (that is, in my flesh,) dwelleth no good thing: for to will is present with me; but how to perform that which is good I find not. For the good that I would I do not: but the evil which I would not, that I do. Now if I do that I would not, it is no more I that do it, but sin that dwelleth in me (Romans 7:15-20). And again in his letter to Timothy, But thou, O man of God, flee these things; and follow after righteousness, godliness, faith, love, patience, meekness. Fight the good fight of faith, lay hold on eternal life, whereunto thou art also called, and hast professed a good profession before many witnesses (1 Timothy 6:11-12). be ye transformed by the renewing of your mind, that ye may prove what is that good, and acceptable, and perfect, will of God. For I say, through the grace given unto me, to every man that is among you, not to think of himself more highly than he ought to think; but to think soberly, according as God hath dealt to every man the measure of faith. the goofy lead in and tail of the video. The music minister needed to listen to the sermon too. 1st: Through our confession, the blood of the Lord Jesus provides full cleansing and forgiveness for all of our unrighteousness and sin. 3rd: If we claim to have no sin, we are lying to ourselves and denying the truth. 4th: We portray Christ as a liar and expel His Word from our lives if we claim to be sinless. These four points are not trivial and shouldn't be taken lightly. We should rejoice and glorify the Lord with thankfulness for the first two points, and take earnest, prayerful heed that we do not stray into the sin of the second two (the mistaken idea that we are sinless now). Furthermore, we see this passage reminds believers that even though the blood of the Lord Jesus has cleansed believers of their sin forever, and they have become free from sin in a spiritual sense (because they are covered with the blood of Christ), they are, nevertheless, still sinners. They have become the children of God, and as their Father, He requires their confessions of sin so that can forgive them and thus a good relationship can be maintained between Father and child. This forgiveness is not judicial, but rather parental. Before we are born again, we have the natural sinful nature and require the judicial forgiveness of God to pay the penalty of our sins. God is a just and righteous Judge and will not tolerate our sins, but the death of His Son pays that penalty, though we are undeserving of this gift of grace. Once that debt, or penalty, has been paid, it never needs to be paid again - Hebrews 10:10 says that we are Sanctified through the offering of the body of Jesus Christ once for all. However, if we are to have fellowship one with another and with God, when we sin, we need parental forgiveness from God as our Father. Truly, He is "faithful and just to forgive us our sin". And then of course, He casts our sins away. They are not remembered even by the eternal Mind. They are to be forsaken by us, they are removed by God, and we are to likewise forget them: Proverbs 28:13 He that covereth his sins shall not prosper: but whoso confesseth and forsaketh them shall have mercy. Thus it is our responsibility to pursue purity, holiness, and sanctification in order to overcome the tendencies of the natural man. We are given exhortation to personally yield to righteousness in order to sanctify ourselves. Romans 6:19 I speak after the manner of men because of the infirmity of your flesh: for as ye have yielded your members servants to uncleanness and to iniquity unto iniquity; even so now yield your members servants to righteousness unto holiness. God also plays an active part in our never ending process of purification of our fleshly nature, by loving us with His everlasting love, and by chastening us, teaching us, testing us and trying us. We read in Hebrews 12:10 For they [our earthly fathers] verily for a few days chastened us after their own pleasure; but He for our profit, that we might be partakers of His holiness. In His epistle to the Thessalonians, the apostle Paul prayed that the God of peace would sanctify the Thessalonians: And the very God of peace sanctify you wholly; and I pray God your whole spirit and soul and body be preserved blameless unto the coming of our Lord Jesus Christ (1 Thessalonians 5:23). We know from the Word of God that without the Holy Spirit, we would never be sanctified. Romans 15: 16 That I should be the minister of Jesus Christ to the Gentiles, ministering the gospel of God, that the offering up of the Gentiles might be acceptable, being sanctified by the Holy Ghost. Paul joined God in the process of sanctification by taking charge of his body so it would not prevent God from doing his pervect work. With God working in us and through us by the Holy Spirit, we are purged and cleansed from corruption. We are also purified from sin and made holy by detaching our affections from the world and its defilements. The Holy Spirit brings us to a supreme love to God. In this sense, we grow up into Christ in all things, as is more clearly explained in Ephesians 4:15 But speaking the truth in love, may grow up into Him in all things, which is the head, even Christ. And again in 1 Thessalonians 3:12-13 And the Lord make you to increase and abound in love one toward another, and toward all men, even as we do toward you: To the end He may stablish your hearts unblameable in holiness before God, even our Father, at the coming of our Lord Jesus Christ with all His saints. Christendom remains in a mixed and corrupt state, which Paul likens to a great house in 2 Timothy 2:20, "in a great house there are not only vessels of gold and of silver, but also of wood and of earth; and some to honour, and some to dishonour". It is necessary to sanctify and "purge" ourselves from evil within the sphere of profession in order that we may be "a vessel unto honour, sanctified, and meet for the master's use, and prepared unto every good work" (2 Timothy 2:21). In times past, as we see evidenced in the epistle to the Hebrews (and this exists in many places still today), there have been some who claim to have been sanctified, at least by their profession. These are those who tread underfoot the Son of God. They treat the blood of the covenant as an unholy thing, and thus become apostates from Christ. They have departed from the association in which they had been sanctified. This is explained more fully and more clearly in Hebrews 10:28 -31 He that despised Moses' law died without mercy under two or three witnesses: Of how much sorer punishment, suppose ye, shall he be thought worthy, who hath trodden under foot the Son of God, and hath counted the blood of the covenant, wherewith he was sanctified, an unholy thing, and hath done despite unto the Spirit of grace? For we know Him that hath said, Vengeance belongeth unto me, I will recompense, saith the Lord. And again, The Lord shall judge His people. It is a fearful thing to fall into the hands of the living God. which individuals are vessels to honour and which to dishonour. There are many popular and sometimes famous preachers, teachers and theologians "which corrupt the word of God" as Paul stated in II Corinthians 2:17. "Take us the little foxes....."
Our Lord expects us to be diligent, sincere and to pursue in earnest the deeper things of God, as much as is possible, as stated in II Timothy 2:15: Study to shew thyself approved unto God, a workman that needeth not to be ashamed, rightly dividing the word of truth. By careful and diligent pursuit of God's Word, we can be set apart from this and sanctified for the Lord. Therefore it is necessary that we be like the believers at Berea whom Paul commended so highly because they, "received the word with all readiness of mind, and searched the scriptures daily, whether those things were so" (Acts 17:11). Of course we must be careful to always take God's Word and believe it without debate or question because His Word is truth (John 17:17) and that is the basis of our conversion and sanctification. The truth is to be declared, not debated. Look with me at 1 Peter 1:23-25, as this passage sums this very well, Being born again, not of corruptible seed, but of incorruptible, by the Word of God, which liveth and abideth for ever. For all flesh is as grass, and all the glory of man as the flower of grass. The grass withereth, and the flower thereof falleth away: But the Word of the Lord endureth for ever. And this is the Word which by the gospel is preached unto you. Again, we must not debate or question God's truth-it is incorruptible, infallible and not up for argument. If we truly want to use God's word for a sanctified and sincere purpose, we must receive it, study it and pursue it with earnest desire to please God. There is another highly important and even urgent aspect of sincere vs. insincere sanctification to God. That is in view of spiritual warfare. When we diligently study God's Word, we will find that we are indeed provided with all the necessary equipment, spiritually, to combat the Devil and anything that he or his helpers may assault us with. These helpers of the Devil do not just come at us in the form of evil spirits, but also as the unsaved people, and even Christians, falsely so called. We're all very familiar with the passage regarding the armour of God in Ephesians, so let's have a look at that and briefly break it down for a bit of understanding in how it plays into our sanctification to God. This goes back to what we were saying last week about active sanctification. We must strive to be set apart for God. Being strong is not something that happens by itself with no effort, either spiritually or physically. Spiritually, we are strong through the Lord and His power and might. It will come into action in how we equip ourselves for spiritual warfare in light of the following verses, and this is the foundation Paul is laying here. There's not a part of the armour of God that we can leave off. The pieces are fitly joined together to provide a full spiritual protection from harm. Furthermore, as we fight against things that set themselves against God and Truth, we are called to 'put on', 'be able to stand' and wrestle, or combat, spiritual wickedness and those who propagate it in this world. To do this, we must be fully sanctified for God's work, as anything less will give our enemy opportunity to tear us down or discredit our stand for God and righteousness. We are set apart, through sanctification to God, so that we can stand, as Paul points out several times in this passage. He wants us to be keenly aware that our call to action is to stand, face into the fight and do battle through the power of God alone. It may be stating the obvious, but each piece of the armour of God is something that we are instructed to put on. This is clearly, at least in my opinion, an act of sanctification through preparing ourselves to battle for righteousness and truth for God, and each aspect of the armour of God can be associated with some requirement for action on our part. Then, in verse 18, there is the part people so very often completely overlook-prayer. Paul does not admonish to pray when the battle gets tough, or when someone you know is struggling. His call is a demand for constant prayer, not only for your own battles, but for ALL saints. But it goes beyond that-our call to action here is also to aid in helping other saints stand fast in their lives, sanctified and set apart for God. We are to assist each other in keeping alert to spiritual attack and prayerful attendance of one another's needs before the Lord through supplication. Lord willing we will finish off this examination of sanctification next week. As we saw in Part 1 and 2, there are many various aspects of sanctification. The last four points we went through all lead us forward in our walk with the Lord Jesus Christ, away from the rudiments of the world. They show us the difference between real sanctification and false sanctification, and finally we see the spiritual warfare which is directly influenced by our sanctification through the armour of God. This use of sanctification in the Bible is found in 1 Corinthians 7:12-14 But to the rest speak I, not the Lord: If any brother hath a wife that believeth not, and she be pleased to dwell with him, let him not put her away. And the woman which hath an husband that believeth not, and if he be pleased to dwell with her, let her not leave him. For the unbelieving husband is sanctified by the wife, and the unbelieving wife is sanctified by the husband: else were your children unclean; but now are they holy. Clearly this is not an ideal situation to get into, by any means. It is wrong to marry someone who you know to be unsaved and unregenerate to begin with. I believe this passage applies best, though not exclusively to, situations where one spouse is saved after marriage and the other continues unbelieving. This use of the word "sanctified" means 'set apart', and the word "holy" there has the same meaning and comes from the same root word in the Greek. This does not mean that the unbelieving spouse or the unbelieving child is saved from the penalty of sin as some would suppose. The unbelieving husband or wife is not made personally holy, nor do the children of believers have personal holiness conveyed to them by virtue of birth relation. Sanctification, therefore, means something besides personal holiness here. As we have found previously, to sanctify is to separate to a sacred use, or relationship. However, here in 1 Corinthians 7:14, Paul uses the terms 'sanctified' and 'holy' to signify that one Christian member of a household brings a sanctifying influence to it, so that all the members are to be regarded as separated in part from the ungodly, unclean world. In contrast, in the Old Testament we read that believers were to separate from an unbelieving partner (read Ezra 9-10) because the people were a holy people set apart to God, and their taking of "strange wives of the people of the land" (Ezra 10:2) was an "abomination" to the Lord. Ezra and Nehemiah [ch. 10] both commanded Jews to part from heathen wives on the ground that they were ceremonially unclean. Under the age of grace and the new covenant made by Christ, Paul states, rather, that the believer cleanses the unbeliever in marriage, and therefore the unbelieving partner, or children, are rendered clean, ceremonially as it were. The phrase at the end of vs. 14, "but now are they holy" indicates they are brought into such a sacred relation that the unbelieving partners are under the power of sanctified influences, and not to be considered a relationship of defilement which usually apply to relationships with the world, James 4:4 - "…know ye not that the friendship of the world is enmity with God? whosoever therefore will be a friend of the world is the enemy of God." It does not end there, however. The unbeliever lives in the constant presence of a testimony of Christ's redemption from the penalty of sin, and witnesses the changes this makes in a believer's life. Although the responsibility of the believer is multiplied by this, the believing spouse is being transformed into the likeness of the Lord Jesus by sanctification through the Holy Spirit. This should be reflected in their walk and talk, thus testifying to the power of God in their lives. The unbelieving spouse has the privilege of having a 'missionary' live under the same roof, so to speak, and thus has a special accountability to heed the Word of God and accept salvation in Him. In this way as well, he or she is set apart, or "sanctified", to this special privilege and responsibility. Likewise, children who have at least one believing parent are said to be "holy" (vs. 14). This does not mean they are automatically saved after they reach the age when they are responsible and have reached understanding, because we know they cannot be saved by association with a believer. Rather, it means that they also are set apart by the special privilege and responsibility of living with a believing parent and having the gospel of the Lord Jesus Christ taught to them personally by their parent(s). Thus it is that Paul explains the way of grace when a person is saved and his or her partner remains unsaved. This passage is not giving existing believers the liberty to marry an unbeliever, as we see evidenced in other Scriptures. The Word of God teaches us by Paul in 2 Corinthians 6:14-18 , Be ye not unequally yoked together with unbelievers: for what fellowship hath righteousness with unrighteousness? and what communion hath light with darkness? And what concord hath Christ with Belial? or what part hath he that believeth with an infidel? And what agreement hath the temple of God with idols? for ye are the temple of the living God; as God hath said, I will dwell in them, and walk in them; and I will be their God, and they shall be my people. Wherefore come out from among them, and be ye separate, saith the Lord, and touch not the unclean thing; and I will receive you, And will be a Father unto you, and ye shall be my sons and daughters, saith the Lord Almighty. to speak, and it is critical that we learn the difference between the holy and the profane (Eze 44:23). This video is a typical case of the jerkwater revival called for in a mixed medium of Satanic modern church house music. These idiots are trying to sing about holiness. Bah! On the issue of separation, Peter says, "But as He which hath called you is holy, so be ye holy in all manner of conversation; Because it is written, Be ye holy; for I am holy." (1 Peter 1:15-16). In other words, we must exchange our natural human tendencies to try to be a 'likeness' of the Lord. Peter directly quotes the statement "Be ye holy, for I am holy" from Leviticus 11:44. Leviticus 11 is a chapter containing a wealth of Old Testament ritual and tradition combined with typology. It goes into great depth describing which animals should be considered clean and unclean. The chapter states a general principle and follows it with several specific cases. Under the law, God required the Israelites to avoid eating certain foods as those foods would defile them according to His law. 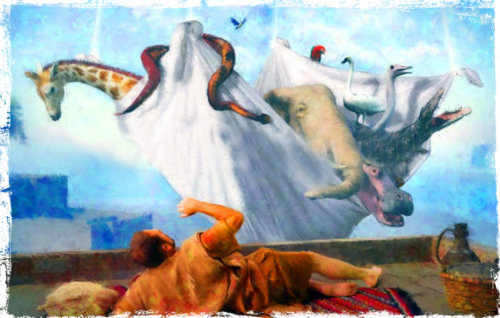 Thus, as we have seen, God proclaimed some animals to be clean and some to be unclean. God's people were allowed to eat only that which was clean. Leviticus 11:1-2 And the LORD spake unto Moses and to Aaron, saying unto them, Speak unto the children of Israel, saying, These are the beasts which ye shall eat among all the beasts that are on the earth. In the remaining verses of Leviticus 11 God specifically outlines all the foods He considered clean and unclean. Now we move on to the good news for us: That is, we no longer live under the law but in a day of grace, and thus we are not restricted from eating any of the food God created to be for our sustenance and use. Some may make little of God's goodness and continue to falsely place the restrictions of the law on us, but Paul exhorts us that food is sanctified, or set apart, for us through God's Word and through appropriate prayer. The food is not holy, but rather set apart from the law for our sustenance and use. As an illustration of this, let's turn back to 1 Timothy 4 and read verses 1-5. We see here, through God's inspiration, Paul writes "Now the Spirit speaketh expressly, that in the latter times some shall depart from the faith, giving heed to seducing spirits, and doctrines of devils; Speaking lies in hypocrisy; having their conscience seared with a hot iron; Forbidding to marry, and commanding to abstain from meats, which God hath created to be received with thanksgiving of them which believe and know the truth. For every creature of God is good, and nothing to be refused, if it be received with thanksgiving: For it is sanctified by the word of God and prayer." This doesn't mean that we should go eat anything and everything that we want. Some things are genuinely unhealthy and will not profit our body at all. These are foods (or food-like products) that we should avoid, as they are contaminates, not nourishments that God created for our use. What this does teach quite clearly, is that we are no longer restrained under the Levitical law regarding unclean and clean animals or foods. But beyond this, Paul says that people who rule out specific food groups through legalism are actually teaching a "doctrine of devils" (1 Tim 4:1b). Acts 10:11-15 and the story accompanying the account there, clearly show us that at the onset of the ministry of the gospel to the gentiles, God pronounced as clean the formerly unclean creatures of the law. As God Himself said to Peter on the housetop, "What God hath cleansed, that call not thou common." The word 'common' here appears to be of some negative connection in the Greek, such as contaminated, polluted or defiled. Backing up what His Son had said previously, God was forcing a change of attitude and perspective regarding the laws of unclean dietary sustenance. Our priority is to be aware of what truly defiles the temple of God - our bodies. 1 Corinthians 3:16-17 Know ye not that ye are the temple of God, and that the Spirit of God dwelleth in you? 17 - If any man defile the temple of God, him shall God destroy; for the temple of God is holy, which temple ye are. A great aid in deciphering what causes defilement of the temple (the body) for believers is found in Matthew 15:11. The Lord was answering a question regarding the question of hand washing, but He answers it in a way that also explains the question regarding whether food defiles us. Christ in verse 11 says, "Not that which goeth into the mouth defileth a man; but that which cometh out of the mouth, this defileth a man." Apart from eating only clean animals, Old Testament believers were required to sacrifice animals to God, and the blood shed by the sacrifice of those animals purified the people, according to God's law. Hebrews 9:11-15 But Christ being come an high priest of good things to come, by a greater and more perfect tabernacle, not made with hands, that is to say, not of this building; Neither by the blood of goats and calves, but by his own blood He entered in once into the holy place, having obtained eternal redemption for us. For if the blood of bulls and of goats, and the ashes of an heifer sprinkling the unclean, sanctifieth to the purifying of the flesh: How much more shall the blood of Christ, who through the eternal Spirit offered Himself without spot to God, purge your conscience from dead works to serve the living God? In the days of the law, men had to work hard towards holiness, following the letter of the law as God commanded to maintain ceremonial cleanness and achieve purification (Leviticus 11:44-45). Despite working continuously to gain holiness, the people of that day were never able to achieve sanctification or justification or redemption as we know it, through all their efforts. Hebrews 10:1-4 For the law having a shadow of good things to come, and not the very image of the things, can never with those sacrifices which they offered year by year continually make the comers thereunto perfect. For then would they not have ceased to be offered? because that the worshippers once purged should have had no more conscience of sins. But in those sacrifices there is a remembrance again made of sins every year. For it is not possible that the blood of bulls and of goats should take away sins. In our day, we have the Holy Spirit dwelling in us who helps us and makes us holy. We need the blood of the Lord Jesus to cover us and purify us and sanctify us, and we need to work to separate ourselves from the world and separate ourselves to God, and we need to work on allowing the Holy Spirit to work in us and through us. According to the words of the Apostle Peter, as believers we are "Elect according to the foreknowledge of God the Father, through sanctification of the Spirit, unto obedience and sprinkling of the blood of Jesus Christ" (1 Peter 1:2). It is through the Holy Spirit that we gain sanctification from the world around us. We can be confident that the Holy Spirit will continue this work through believer's lives, never ever giving up or failing us - "Being confident of this very thing, that He which hath begun a good work in you will perform it until the day of Jesus Christ" (Philippians 1:6). Scripture: Romans 8:38-39 "For I am persuaded, that neither death, nor life, nor angels, nor principalities, nor powers, nor things present, nor things to come, Nor height, nor depth, nor any other creature, shall be able to separate us from the love of God, which is in Christ Jesus our Lord." No power on earth or beyond can change the deepness with which God loves us. (Ephesians 3:17-19) That Christ may dwell in your hearts by faith; that ye, being rooted and grounded in love, May be able to comprehend with all saints what is the breadth, and length, and depth, and height; And to know the love of Christ, which passeth knowledge, that ye might be filled with all the fulness of God. Ephesians 5:1-2 Be ye therefore followers of God, as dear children; And walk in love, as Christ also hath loved us, and hath given himself for us an offering and a sacrifice to God for a sweetsmelling savour. 1 John 4:8-10 He that loveth not knoweth not God; for God is love. In this was manifested the love of God toward us, because that God sent his only begotten Son into the world, that we might live through him. Herein is love, not that we loved God, but that he loved us, and sent his Son to be the propitiation for our sins.